You are here: Home / Watch Brands & Horology / Events, Fairs & Exhibitions / The 2015 Red Dot Has A New Watch Category. And The Winners Are . . . . There are an unusually large number of design awards, but not one of them holds a candle to the Red Dot, which is inarguably the most famous and important of them. The Red Dot awards prizes for design in a multitude of categories, from refrigerators to lawn mowers and everything in between. These prizes are also awarded on many levels, e.g. Best of the Best, Honorable Mention, etc. However, until the 2015 edition of the competition, there has never been a dedicated watch category. The 2015 Red Dot “watch” awards of 2015 go to a total of eleven horological products, which include one mechanical movement and even a strap. 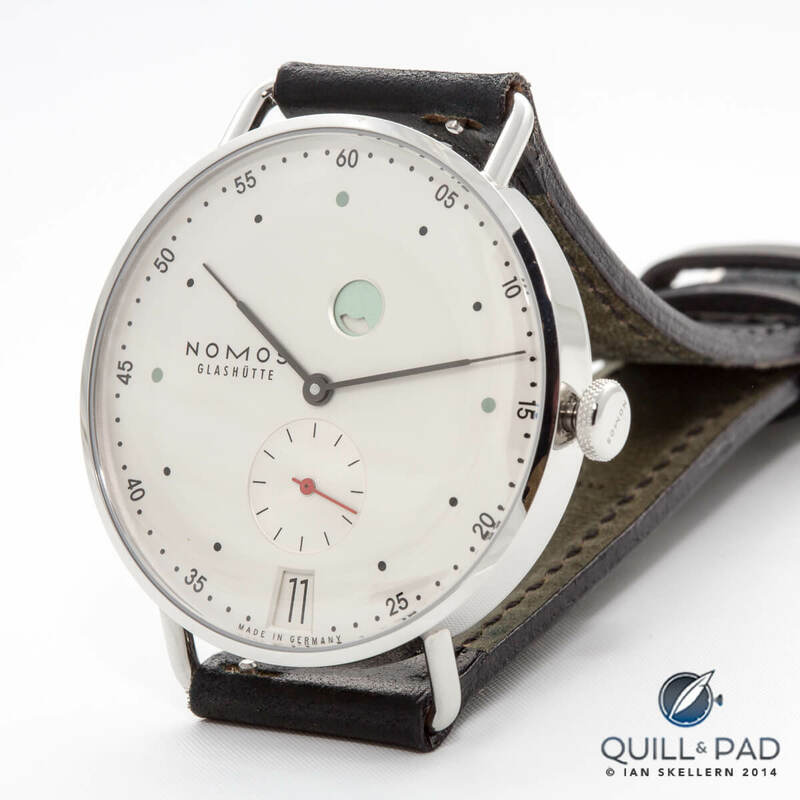 One watch received an Honorable Mention for an especially successful design detail. Two of the watches received the highest honor, which is known as Best of the Best. These are the Horological Machine 6 Space Pirate by MB&F and the Apple Watch. Other winners of Red Dot awards in the watch category include: Armin Strom Skeleton Pure Water, Jacob Jensen Strata Series, Maurice Lacroix Pontos Date, Maurice Lacroix Pontos S Supercharged, MB&F HM 5 Carbon Macrolon, Nomos Metro, Porsche Design Timepiece No. 1, Sony SmartBandTalk SmartWatch 3, Eone Timepieces The Bradley, Meistersinger Caliber MSH 101, and the Hirsch Performance Collection strap. There are three judges in the new watch category: Professor Herman Hermsen (professor for jewelry and product design at the Fachhochschule Düsseldorf), Günter Wermekes (self-employed goldsmith and designer), and Rüdiger Bucher, editor-in-chief of German watch magazine Chronos and head of editorial for the watch division of the Ebner Verlag publishing house. While Hermsen and Wermekes had previously been jurors as specialists in jewelry design, the affable Bucher was new to the Red Dot in 2015. Bucher’s addition to the jury plus the creation of the watch category really made me sit up and take notice. For this reason, I decided to ask him a little about the behind-the-scenes of the famous Red Dot Design Award and how the choices are made. Q&P: Why was there a separate Red Dot watch category this year? What changed? RB: In 2014, Chronos did an interview with Red Dot director Professor Dr. Peter Zec for the Chronos special issue about watch design (Chronos Spezial Uhrendesign). I think it was during that process that Prof. Zec got the feeling that there should be a separate category for watches. (Before that, there was a category for jewelry and watches together.) In my opinion, Prof. Zec made the right decision because watches and jewelry are really different products. Q&P: How important do you personally find design to be when judging a watch overall? RB: Design is one of the main reasons to actually buy a watch. I think it has become even more important over the years. Let’s look at the field of mechanical (and not only, but chiefly, luxury) watches: back in the 1990s, the decision to buy a mechanical watch was mostly driven by the mechanical movement inside the watch. People cared about the craftsmanship and the beauty of a mechanical movement, acknowledging its superiority – not in precision but in craftsmanship and, not least importantly, art – over a quartz movement. Today, a mechanical movement is somewhat “natural” in a high-end watch. Many people care first about the brand and the design. For it to be mechanical is almost a matter of course. Q&P: Was design your only criteria for judging the Red Dot watch competition? Q&P: How hard was it for you to judge the smartwatches submitted? What criteria did you use? RB: The same as for any product: criteria like degree of innovation, functionality, formal quality, and durability, but also symbolic and emotional content. I think it’s important that a watch has a strong appeal and brings something new to the market in terms of design. Q&P: How did a movement get honored (Meistersinger Caliber MSH 101) and not the whole watch? RB: Brands and manufacturers are relatively free in what they submit to Red Dot. Once they have submitted it (and paid the fee), it becomes one of the products for us jurors to assess. The decision to let a movement pass to assessment was not done by the jurors but by the Red Dot team. We just saw it there among the watches and gave our opinion. Q&P: What did the three judges find so unique and/or special about the Apple Watch to award it a Best of the Best? RB: The Apple Watch convinced us all thanks to its special design concept, the high quality of workmanship, and the new idea it brings into the watch market. Its shapes and angles, the possibility of effortlessly removing the straps and bracelets, the easy-to-handle buckles, and the general ease in operating it set it apart from other smartwatches, and it convinced all three jurors. Q&P: What’s the difference between Best of the Best and a “normal” Red Dot winner? RB: The three jurors (it’s always three for every category) have the opportunity to award one to two percent of all products within a category with a Best of the Best distinction. For a Best of the Best, all three jurors must agree – whereas for the regular Red Dot, it can be a two-to-one decision. Q&P: How does a brand get more than one watch as a winner (like Maurice Lacroix did this year)? RB: There is no limitation. Brands can send in as many products as they like. Taking part for the first time, I noticed that there are some brands entering watches every year and there are still many brands that don’t. I’d like to hereby to encourage every important watch brand to enter their watches. A watch does not have to be a “design watch,” it just needs to have good design. That said, Patek Philippe and Rolex would have good chances to win a Red Dot in my opinion. Q&P: How will you apply what you’ve learned as a Red Dot judge to how you view brands and timepieces in the future? 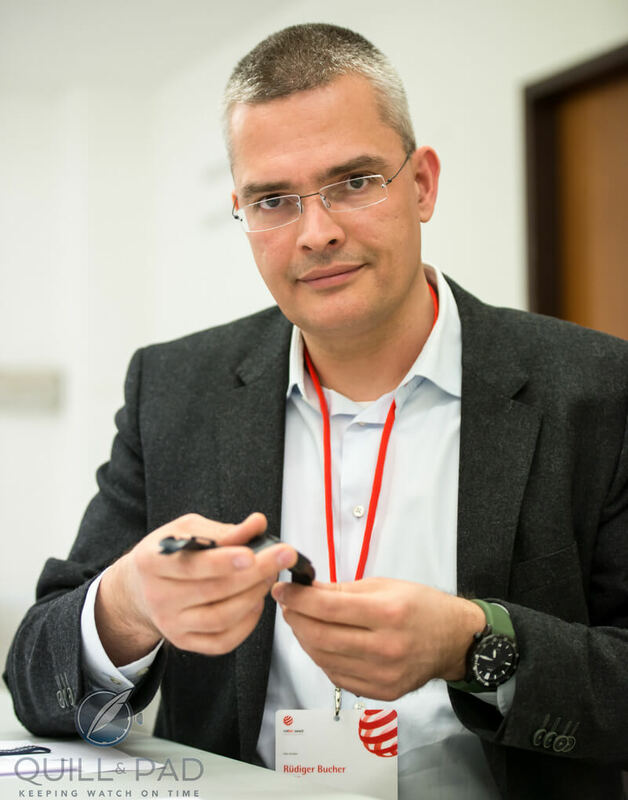 RB: Being a Red Dot judge was a tremendous experience, not in the least because I had the opportunity to talk with so many great, experienced designers – not only in the field of watches, but in every category. This experience certainly helped shape my understanding of design in general and the importance of it. I started the Chronos special issue about watch design in 2013 to put more emphasis on design apart from mechanics and movements. This was already due to the fact that design is one of the main reasons for people to buy a watch. Even if a watch is mechanically sophisticated, you won’t buy it if it doesn’t meet your personal taste. My hunch is that design has become ever more important – even to the complication geeks. And this has now likely been supported by me becoming a Red Dot judge. Is The Biggest Risk To National Security The Apple Watch And Fitness Bands? 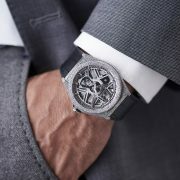 MB&F’s Horological Machine 6 Alien Nation: Space Invaders Aren't Coming, They're Already Here!